And so here we are, another month down. Where is this year disappearing? 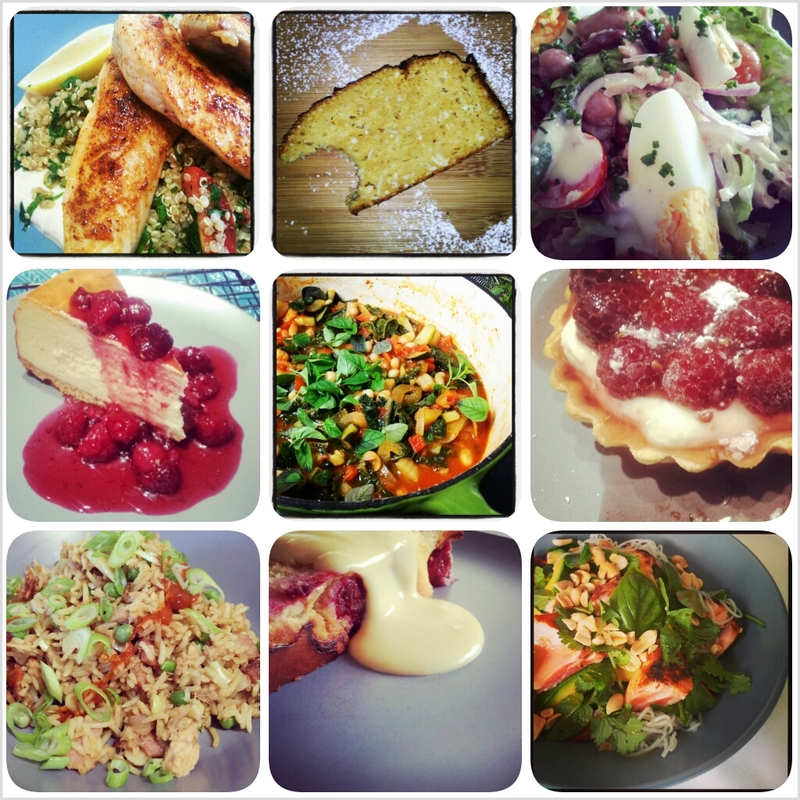 Another month of cooking fabulous, delicious things, without too many failings or freak outs! Top 3 cheap and cheerful and vegetarian!!! I feel like I am starting to get my groove on with this whole little challenge now. It feels really comfortable. The next step is to write a list of all the recipes I have tagged and where they come from. I do this by year. Once this is complete, this is the list I go to each week to create my menu plan. It is a quick glance system where I can choose a good balance of sweet or savoury, easy or difficult recipes to cook based on my time and other commitments that week. For example, I save complicated or time consuming recipes for the weekend when I have more time. I hope that this gives you a little insight into how I find the time to cook my family a delicious meal every night. I would really like to thank each and every one of you who have taken the time to read the blog, leave a comment or like what I am doing. I am particularly chuffed by how many of you have already signed up to take part in the very first My Delicious Year cook-a-long. In case you are yet to sign up, the recipe and shopping list is out now. Head over to the My Delicious Year facebook page to be kept up to date with what is going on. And mark your calendar for Wednesday 1o April. I look forward to continuing to share My Delicious Year with you! As a mother of a 2 and 4 year old it is a constant battle to make sure my children are eating a balanced diet. When it comes to vegetables, that battle is far from won. My children are very much routine kids. They like to know where we’re going, when we’re going, for how long and who else will be there. When it comes to dinner it’s pretty much the same. When is dinner? What’s for dinner? What’s for dessert? We are almost at the start of month three of the My Delicious Year challenge. During the past two months I have abandoned all the tried and tested family favourites in lieu of cooking my way through the more than ten years of delicious. Magazines I have been collecting. This means the kids have been served something different for dinner every night for the past sixty days. For kids who love predictabilty, this has been a challenge. So of course there have been some highs and some lows. But I am regularly suprised by what they actually eat versus what I think they will eat. Prepared for the usual bribery negotiations required to get the kids to even try it, I was surprised to watch B2 tuck in with absolutely no fuss at all, and ask for more! What the? B4 on the other hand commenced his usual “ew it has green stuff” meltdown. Fortunately, being the Easter long weekend, we had an abundant supply of chocolate bribery available. But before we bring out the chocolate, we put in place the “mouthfuls” rule. Leave a comment to share what strategies you use to get your kids to eat their vegetables or to try new foods? Join in for a once a month cook-a-long. On the first day of each month I will provide you with a recipe and shopping list. The recipe will be affordably priced and of easy to moderate difficulty. The cook-a-long will take place on the second Wednesday of each month. An event will be created on the My Delicious Year Facebook page at the start of each month. Please join the group to stay up to date, and don’t forget to invite your friends to join in. Where will the cook-a-long take place? The idea is for you to cook the recipe in the comfort of your own home. Cook the selected recipe for your family, friends, neighbours or someone special. Once you are finished cooking, take a moment and capture a photo your meal. Post your picture and comments on the My Delicious Year Facebook page or share it on instagram using the hashtag #cookalong and tag @mydeliciousyear. One of the main goals I set when starting out on this blogging adventure was to inspire others to cook. The idea behind the cook-a-long is to encourage you to try a new recipe each month by making it accessible to all and as simple as possible. After the cook-a-long we can then come together as a group to talk about the recipe – like a virtual book club, but for recipes. The first cook-a-long will take place on Wednesday 10 April. I’d love to hear what you think about this idea and whether you will be participating. Who would have thought it. 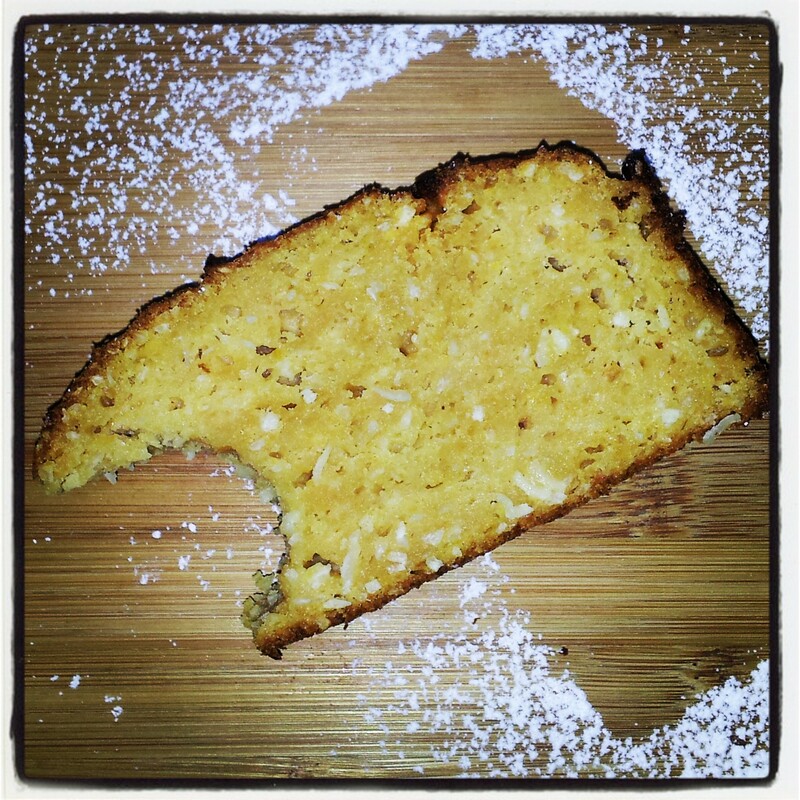 Chickpeas in a cake. Well actually James Reeson did. James who, you ask? Well back in 2002 he was the “celebrity chef” featured in the March delicious. magazine. Famous for his pony tail and a show called “Alive & Cooking“. No, still don’t remember??? Not so much a celebrity anymore. But he did come up with this genius idea to combine chickpeas and apricots into a cake. The combination intrigued me so I had to give it a go. The chickpeas are blended with dried apricots and apricot nector so you can’t really pick up on their flavour. In fact, if I did a blind tasting with you I am sure that you wouldn’t even know that there was chickpeas in the cake. The end result is a very mild tasting, beautifully moist cake. The next time I make it (and I will definitely make it again!) I might pimp it up a bit and add the zest of an orange and maybe replace the apricot nectar with fresh orange juice to reduce the amount of sugar in the cake. 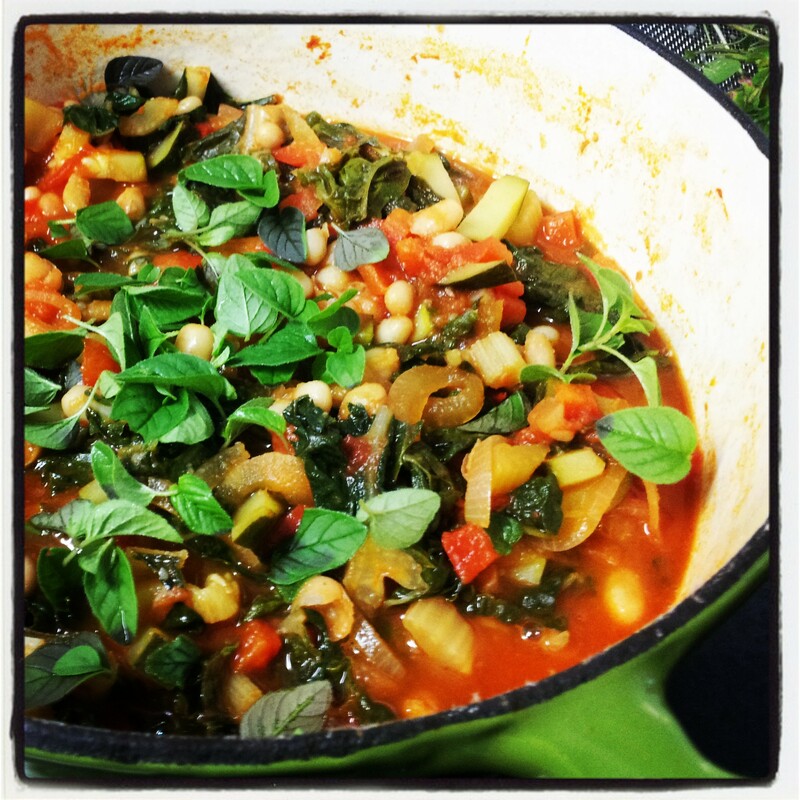 Chickpeas are so incredibly versatile. Adding them to a cake was just a genius idea! Preheat oven to 170 degrees celcius. Grease and line base of a 10 x 23cm loaf pan. Place apricots and nectar in a bowl and set aside for 30 minutes to soak. Transfer to a saucepan over medium heat and simmer for 15 minutes. Add chickpeas and cook for 5 minutes. Set aside to cool. Place in a food processor and blend until a smooth puree. Add the sugar and blend for a few more seconds. Tip into a bowl and fold in the flour, coconut and a pinch of salt. Add the oil and 100ml water and stir to make a smooth batter. In a separate bowl, beat egg whites until soft peaks form. Gently fold into batter until combined. Pour in the loaf pan and bake for 1 hour until a skewer inserted into the centre comes out clean. (If it browns too quickly, cover with foil.) Turn onto a wire rack to cool. Dust with icing sugar and serve with thick yoghurt and a drizzle of honey, if desired. Pork. Not something I cook often. In fact, I can’t remember the last time I cooked it. Maybe a bit of mince in a spag bol or a chop to appease Mr Picky Palette’s demands for a taste of his youth. But here I go – pushing my culinary boundaries. I confess to being a little bit confronted by the 1.5kg of pork shoulder, on the bone, which I purchased from my local meat man. I was a little bit overwhelmed by that kind of porky smell that pork has (funny that!). Fortunately, the recipe I had chosen to make, Katie Quinn Davies Slow-roasted pork & red wine ragu with pappardelle from the March 2013 issue of delicious. magazine, required very little preparation. A good season with salt and pepper. Pop it on a rack. Underneath, in a roasting tray, place a couple of roughly chopped onions, a whole head of peeled garlic, a cup of water and half a bottle of red wine (preferably shiraz). It then goes into a slow oven (140 degrees celcius) for six hours! This is a recipe you definately want to get started first thing in the morning if you want to eat your dinner sometime before midnight! After four hours of cooking, the recipe asks you to put eight large roma tomatoes onto a separate tray in the oven with the pork. My little oven wouldn’t fit another tray so I just added them to the onions and garlic underneath the pork. No harm done. One less tray to wash up though! Win! 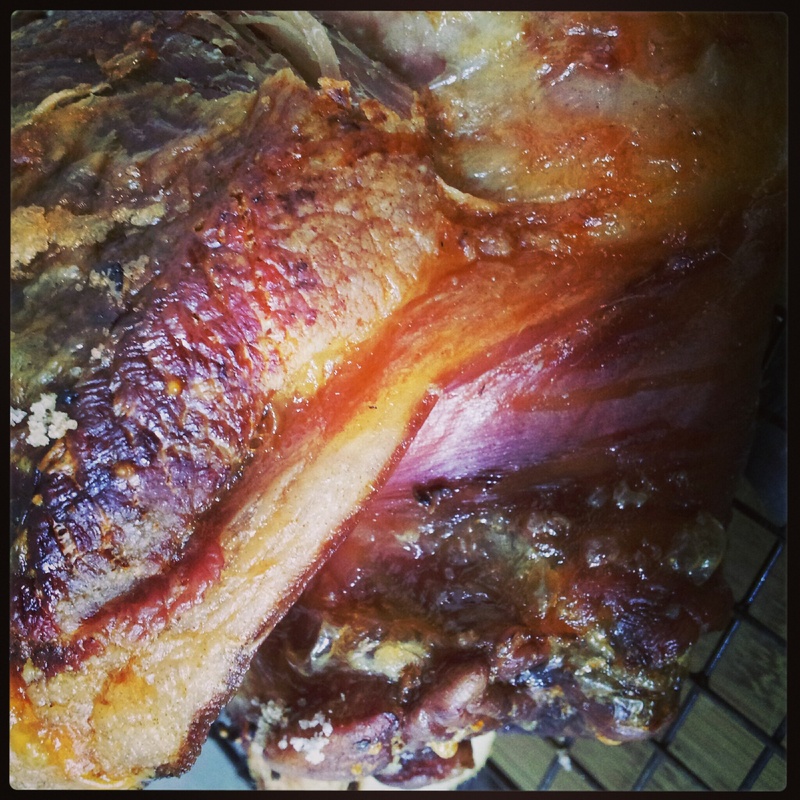 I was surprised by how crispy the outside of the pork got even from being cooked at a very low heat. Not sure if this was supposed to happen. Fortunately, a special friend of mine (hello Leo!) had coincidently cooked this same recipe the day before me, so a quick text to her to find out that she too had ended up with crispy pork. Good. When the six hours is up, everything comes out of the oven. The tomatoes, onion and garlic get blitzed in a food processor along with the basil (which I didn’t have – oops! I replaced it with a handful of parsley.) I admit that basil would have tasted better though. 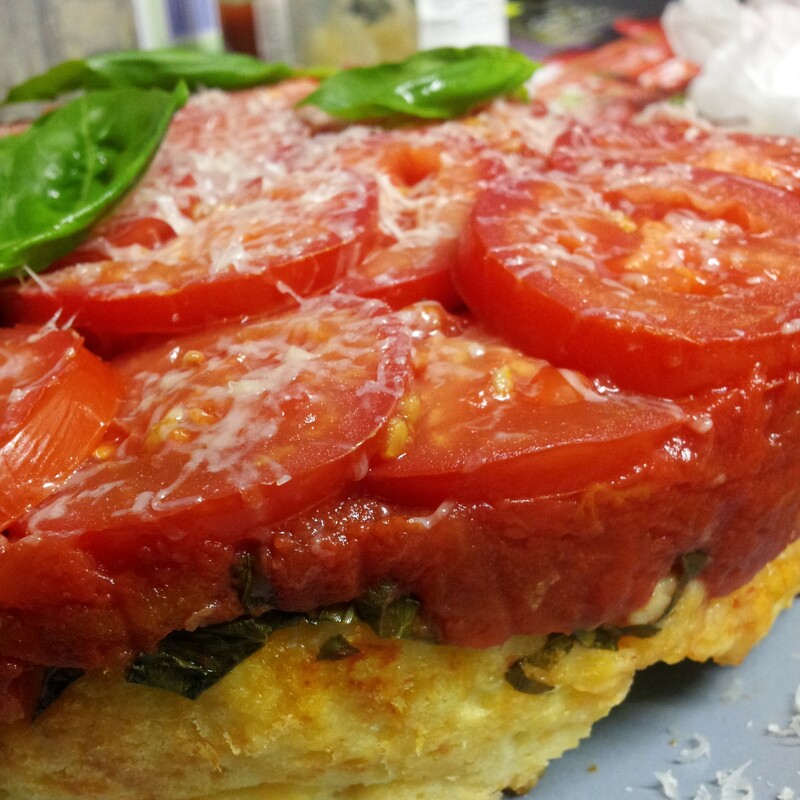 Tomato and basil are meant to be together! This tomatoey mixture then goes into a clean saucepan with two tins of canned tomatoes, a tablespoon of balsamic vinegar, the zest of one lemon, two tablespoons of chopped oregano (from the garden of course!) and the other half of the bottle of wine. It gets simmered for 45 minutes until the sauce is thick. 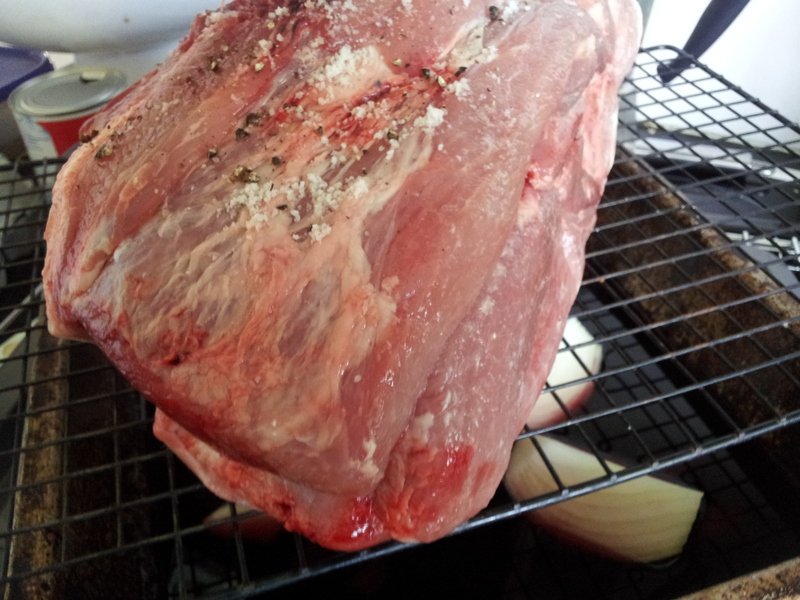 Once the shoulder of pork is cool enough to handle, shred the meat and discard any skin, fat or bones. I also put aside any meat that was too crispy for a sneaky treat for Mr Picky Palette later. Best wife ever, right? 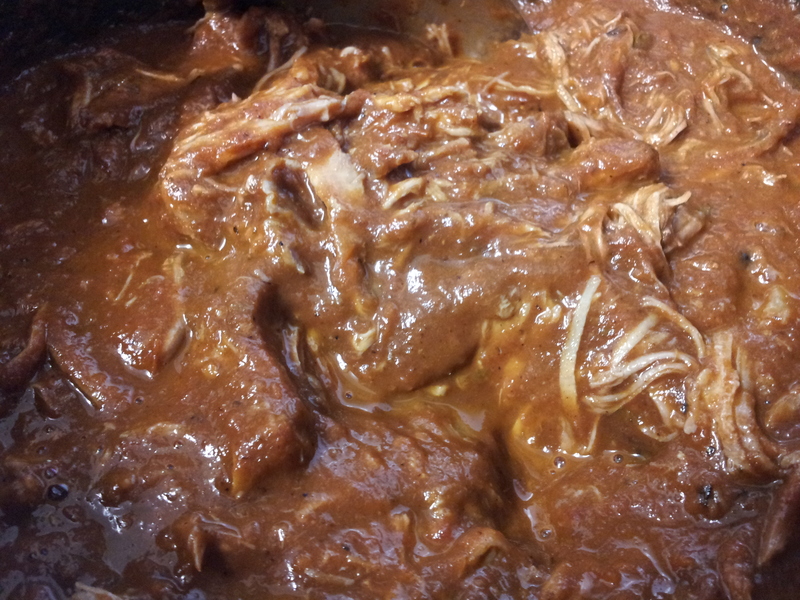 Once the sauce is nice and thick, all the pork goes into the saucepan for a few minutes to heat through. The recipe called for packet pappardelle. You know me. I made my own pasta using my fool-proof Jamie Oliver basic egg pasta recipe which I’ve shared with you before. There is something about fresh pasta. It just tastes so much better. Do it! Do it! Do it! Once you’ve cooked the pasta, stir it through the sauce and serve it up with freshly grated parmesan. Delicious! But you know the whole time I was shredding the pork all I could think of was crusty bread and creamy coleslaw. 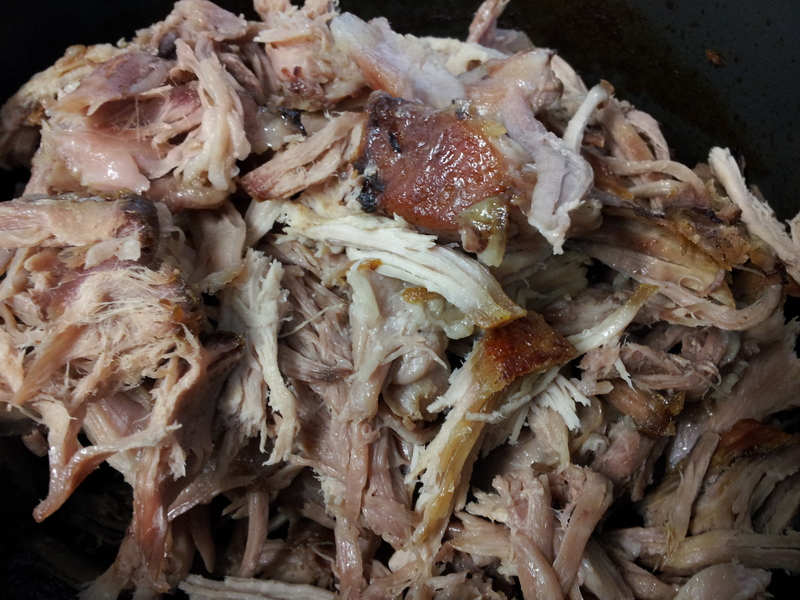 Note to self: next time one decides to spend the whole day with the oven on roasting a shoulder of pork, save some for a sandwich! P.S I lied – I actually have cooked pork before. I just remembered. I roasted a ham last Christmas and the one before that. Obviously not memorable! 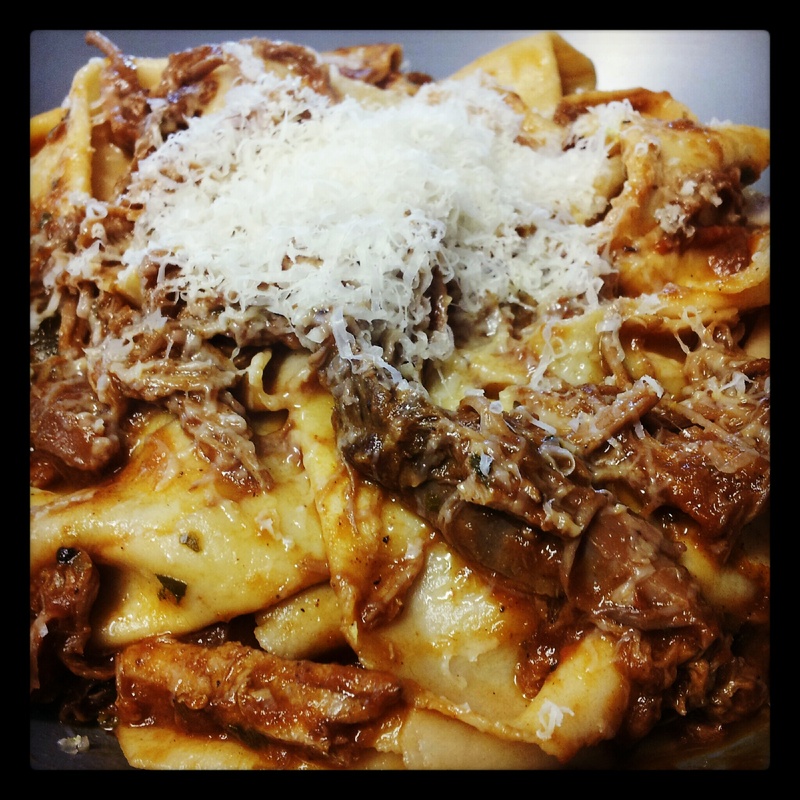 600g pappardelle* MAKE YOUR OWN! YOU KNOW YOU WANT TO! Preheat the oven to 140 degrees celcius. Scatter the onion and garlic over the base of a large roasting pan. Sit a roasting rack over vegetables and place the pork on the rack. Season well with sea salt and freshly ground pepper, and drizzle liberally with olive oil. Pour half of the wine (375ml) and 1 cup (250ml) of water into the base of the pan, over the onion and garlic. Slow-roast for 6 hours, checking every hour to make sure that the liquid doesn’t fully evaporate (if necessary, add extra water to the pan). I needed to a couple of times. Place the tomatoes on a baking tray, then season and drizzle with olive oil. Roast with the pork for the final 2 hours of cooking time. Remove roasting pan and tomatoes from the oven. Place the tomatoes, onion and garlic cloves in a blender, along with the basil. Whiz until a smooth sauce. Place tomato sauce in a large saucepan, along with canned tomatoes, vinegar, lemon zest, oregano and remaining 375ml wine. Season and simmer over medium-low heat for 45 minutes or until well reduced. Shred the pork, discarding the skin, fat and bones. Add the meat to the saucepan and cook for a further 15 minutes or until reduced and thick. Meanwhile, cook pappardelle according to packet instructions. Drain and divide pasta among serving bowls. Ladle pork over pasta and scatter with parmesan before serving.